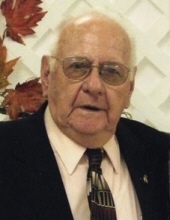 Celebrating the life of Clyde Taylor Jr.
Obituary for Clyde Taylor Jr.
Clyde Taylor Jr. age 90 of Pikeville, Kentucky passed away Sunday, February 3, 2019 at his home. He retired from Ky. WVa. Gas Co. after more than 30 years in the administration office and early in his career he taught school in a one room schoolhouse at Hatfield, Ky. He was a member of the Main Street Church of Christ. Clyde was born in Pikeville, Kentucky on December 15, 1928 the son of the late Clyde Taylor Sr. and Dorothy Scott Taylor. Along with his parents he was preceded in death by his wife, Violet Mullins Taylor and one sister, Phyllis Allen. He is survived by his son, Robert M. (Molly) Taylor of Murfreesboro, TN, one brother, Billy Joe (Fern) Taylor of Lexington, KY and one sister, Ann (Bob) McKinney of Meta, KY.
Two grandchildren, Rebecca J. (Jeremy) Smith of Murfreesboro, TN and Matt (Tara) Taylor of Milton, TN and five great-grandchildren, Madie Smith, Kaitlin Taylor, Peyton Smith, Miley Smith and Samantha Taylor. To send flowers or a remembrance gift to the family of Clyde Taylor Jr., please visit our Tribute Store. With Josh Allen and Keith Blackburn officiating. "Email Address" would like to share the life celebration of Clyde Taylor Jr.. Click on the "link" to go to share a favorite memory or leave a condolence message for the family.